Serenity returns to Persephone for a dual purpose: Inara has a client and the crew has a job. Badger, who had previously refused to fence the Serenity crew's goods, now comes to Mal hoping he will broker a deal to move some cattle offworld to Jiangyin. Sir Warwick Harrow refuses to deal with so low-born a gent, but Badger thinks that Mal is respectable enough for Sir Warwick to speak to. Badger gets Mal an invite to a party, which he attends, with a lushly dressed Kaylee as his date. Inara is also present with her client, Atherton Wing, who tries to convince her to be exclusive to him. While Kaylee is shunned by the women at the ball, but bonds with the men-folk over engineering minutiae, Mal objects to the attention that Wing lavishes on Inara, which leads to violence. Violence leads to a duel with swords, an instrument Mal is ill-equipped to handle. - The planet terraforming process is highly labor intensive, and slave labor is often employed. - Mal making fun of Kaylee's fixation with the ruffly dress. - Kaylee showing up at Inara's party with the big ruffly dress that she wanted. - Mal dancing with Inara, interrupting her date. - Kaylee mingling with the guys about mechanic topics. 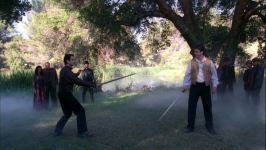 - Mal punching Atherton, accidentally challenging him to a duel. - Mal's reaction to the duel being fought with swords: "Use of a s-what?" - Mal: "I never back down from a fight." Inara: "Yes you do, you do all the time." Mal: "Well yeah, but I'm not backing down from this one!" - Jayne: "I say Zoe gets naked." Wash: "No." Jayne: "I could get naked." Everybody: "No!" - River mimicking Badger's accent and then dressing him down with apparent knowledge of his person. - Inara: "It takes less than a pound of pressure to cut skin." Mal: "You know that? They teach you that in whore academy?" Inara: "You have a strange sense of nobility, captain. You'll lay a man out for implying I'm a whore, but you keep calling me one to my face." An episode which is the complete antithesis of the mistakes of the last one, Shindig is a mighty fine outing. With the exception of the annoyingly irrelevant bar brawl teaser, this episode jumps off with marvelous continuity right from the start using the Badger character to set up the crew with some new smuggling work. The resulting events give us a fascinating and highly entertaining look at Mal's, Inara's, and even Kaylee's characters as they attend the fancy party. Fascinating as well is the detailed depiction of Persephone's high society which, true to the Firefly universe, is delightfully anachronistic. A charming mix of the old American west and a technologically advanced society induced by scarce resources and scarce Alliance presence. Mal's posturing for Inara makes much more explicit the previous implied romantic tensions between them. She wants him and he wants her but there is something stopping either of them from declaring it outright, perhaps their philosophical differences about what a proper career is. Mal sees himself as an honorable thief but Inara's career as dishonorable, despite being legal. Such unrequited love stories can be irritating but in this episode it's just as charming as the depiction of Persephone's high society. All of this character exploration is cleverly wrapped up into the primary goal of Mal and crew securing new smuggling work and the respect of both a new client as well as an old client. Overall, Shindig is a great story and a lot of fun.